In the story of The Wizard of Oz, as we know, the Wizard wants nothing more than to get out of Oz. He wasn't a native Ozzie: he ended up there by accident, of course, when his balloon went astray, and when he was finally able to use his balloon to get out of Oz, he was a very happy camper. He didn't like being an ex-pat. Neither did Dorothy, and her ticket home involved the ruby slippers, three little heel-clicks, and a mantra: There's No Place Like Home. The message of the story is clear: you're SUPPOSED to want to go home, no matter where you roam. Be it ever so humble. But some of us ex-pats don't want to go home. Not until we've fully had whatever experience we want to have in the place we've chosen to make our foreign home. For some, having that full experience might take only months; for others, years. It's different for all of us, but what we share in common is we love to travel and experience new places. We live for it. It's what makes our lives worth living. It's all about the experience. Lest you think I'm about to pack up stakes in Paris and ship myself and all my stuff back to New Jersey already, my response to that is: "Nuh-UH!" No way. Not happening. Not anywhere NEAR ready for that yet. It's not me who's leaving Paris. MY Wizard just found out that he's getting sent BACK to Oz -- for good -- because of his job. He has to leave Paris even though he just barely got here; he broke the news to me this evening. The engineering project he's working on IS going forward and he's going forward with it, but due to the exhorbitant costs of doing business in France, the powers that be within his company have decided to ship everyone back to Brisbane, Australia, lock stock and barrel, and base the project back there. They knew this might be a possibility but they thought not until perhaps around October. Except it's happening NOW. The Paris team has their marching orders: pack it up, do what you have to do to get out of your Paris apartment leases, and get back to Brisbane as quickly as you can so we don't lose too much time on the project. There are a few dozen people here that are impacted by this; not just unattached men like The Wizard, but people who have uprooted their families to come here. He says this is a pretty common thing within this particular company; it's part of being a huge global engineering consulting company, and people get used to being sent wherever they're needed. Kind of sounds like the military in that respect. And he absolutely DOES NOT want to go, despite the fact they've actually changed his role and promoted him in the process, and despite the fact that already owns a home in Brisbane and loves it there. But he also loves Paris and the role he had before allowed him to have a lot of travel to great places which he just loves. This new promotion will mean being based in one spot for a while. And away from Paris. I'd like to think that perhaps part of his disappointment at leaving Paris is also because he's having to leave me. Before we have even had a chance to figure out what's what. Could I BE any more disappointed right now? I have no idea what this means for things between us other than I guess we will try and spend more time together before he goes, and make the most of the time he has left here. We're planning to have dinner on Thursday for starters, and then there's this weekend where we could make plans to get together. But I'm going to be back in New Jersey from April 3-11, so I even had to ask him: do you think you'll be here when I get back? Because he might just have to move THAT fast. He said he thinks there is a good chance he will still be here but he's not sure. And he certainly won't be here much longer than that. I have heard of people doing international long distance relationships that actually work out. In fact I happen to personally know an Australian/American couple who met at a professional conference one year where nothing much happened between them, although they noticed each other. Then they met at the same event the following year and it was like the Gods hit them both with a big old Love Bomb, because they didn't know what hit them. Obviously they had to separate after the conference and she had to go back to Australia, but somehow they did a long-distance thing for a few months before deciding they just had to be together. So they worked something out where they would spend part of the year in each country, and they did eventually get happily married. So these LDRs can work for some people although I'm sure it's rare. But in my case with The Wizard, we've barely had time to get to know each other. Although in some respects I feel I've known him a long time because we've been in contact since November, we've only had 4 dates! I'm just getting used to having a man around again after years of "relationship drought". I know I like him very much, and he seems to have many of the personal qualities I would want in a partner. I know enough about him to know there is potential for me to like him even more, and maybe for things to go far beyond that given the right circumstances. But I don't know that being separated by a half a planet is what I'd call "the right circumstances". I am trying to stay optimistic and open-minded about this. If this could become something important then I guess that will be obvious in due course, and in the meantime why not spend what time we can together and enjoy it? At least if it doesn't work out, it won't be for any of the usual painful reasons; it's just bad timing, distance, and circumstances beyond our control. But wouldn't that just be a damn shame if that were the case? 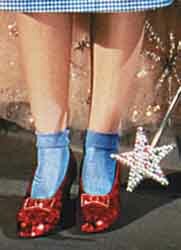 Which makes me wonder and wish: can the ruby slippers work in reverse? Like, if I went out tomorrow and bought a pair of red sequined shoes (believe it or not, they are in fashion here right now) and clicked my heels 3 times, could I keep him here a bit longer?? Long enough for us to know if there's something worth working for??? Or would the slippers send me THERE, to Oz???? Would I even want that????? And it is possible for me use any more question marks in this paragraph?????? I have to say, I did not see this one coming. Not by a long shot. I thought my biggest worry in this relationship was how long it would take before one of us felt comfortable enough to fart in front of the other. And I was just hoping it wouldn't be ME.